1) Place leash loop over strap button. 2) Twist leash loop until it is tight against the strap button. 3) Install strap over the leash loop. Note: Straplocks can only be used with a matching Straplock button. 3) Insert threaded end of Straplock through the slit in the strap. 1) Remove both the nut and washer from the Straplock shoe. 2) Orient the strap so that the outside (the pretty side) is facing up. 5) Replace and tighten nut using a 13 mm socket. 6) Pull knob and slide Straplock shoe over the strap button. It should click when seated properly. Note: Again, do not use leash with Straplocks. 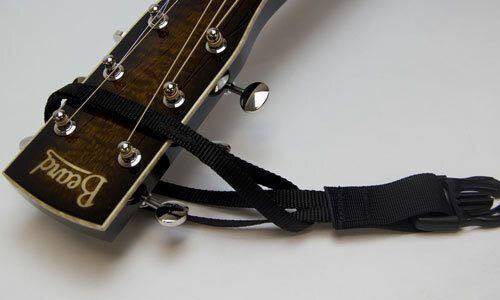 1) Disconnect the headstock loop at clip. 2) Slip loop between upper sets of tuners and under strings. 3) Put clip end through the loop. 4) Gently tighten the loop until it is snug on headstock.